Starting out at the Garrick Avenue pre-school, then attending St Ives North Primary and St Ives High schools, and then continuing her studies at (what was then) Ku-ring-gai College of Advanced Education in Lindfield, Nina’s has been a life of geographical stability! But that stability hasn’t been echoed in every aspect of her life. She studied to be a primary school teacher, has spent most of her adult life working in publishing, and somewhere in there she was also a graphic designer working at Playbill (then in Pymble). It was at Playbill she met Nita Lewis, also a graphic designer, and the two of them became lifelong friends. 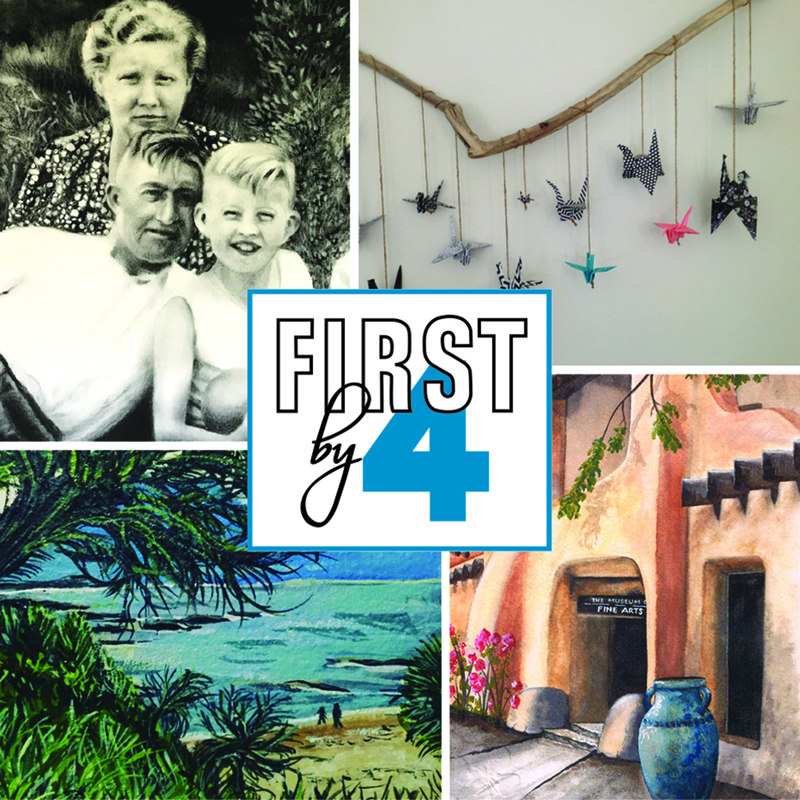 Nina and Nita are two of four friends and artists who have joined forces to present ‘First by 4’, with all four having worked at some stage in graphic design. 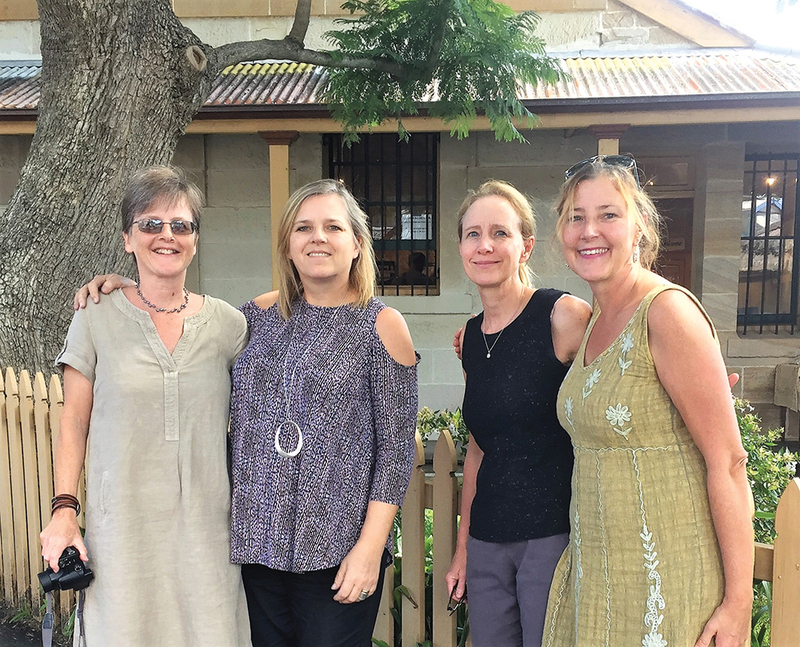 It was the result of both mundane and serendipitous circumstances that, many years after having met Nita, Nina met both Joanne Martin and Nicole Miranda, and when her painting teacher encouraged her to think about exhibiting, it was Nita, Jo and Nic she turned to. So together for the first time and for one weekend only, their work will be on display at the Balmain Watch House. With inspiration coming from near and far, and the style and specific subject matter of these four women being so varied, visitors can expect an interesting collection of artworks. ‘Nita is amazing whatever she puts her hand to,’ says Nina, ‘but for this exhibition she has done the most fabulous charcoal drawings; Jo is inspired by nature and focuses on sustainability in her work, creating some wonderful 3D pieces; Nic is a painter and ceramicist who is influenced by the beauty of the natural world; and I paint with watercolours. For this exhibition my focus is on doors. ‘It is said that a person’s eyes are the window to their soul,’ she continues, ‘so perhaps a door is the window to the heart – the heart of a structure, be it a home, a gallery, a church or a restaurant, a hotel or even a prison. A door can offer a hint of what’s beating within. But only a hint! 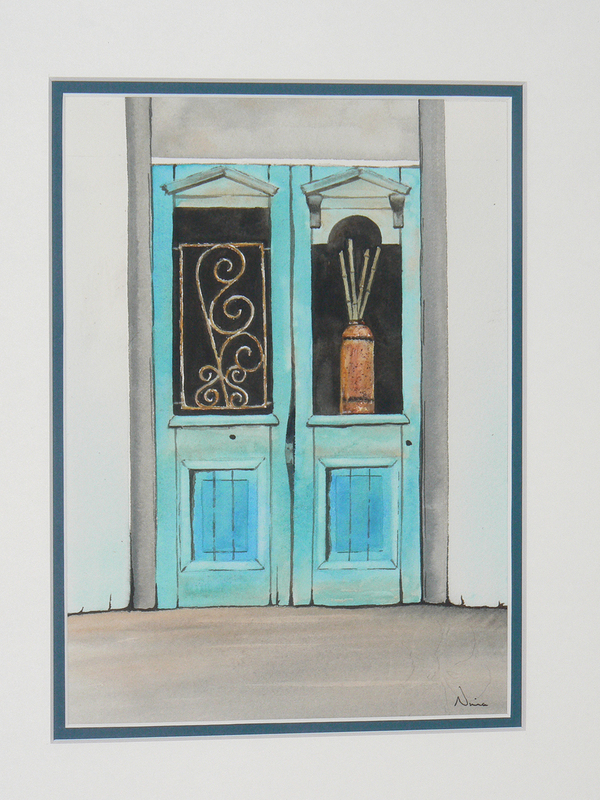 Just as the face a person presents to the public may give nothing away of what’s going on in that person’s life, doors too can hide a multitude of secrets!’ Painting images from the built environment allows Nina’s mind to wander – to places she’s been and places she’d like to go. She admits it’s an opportunity to dream, and who doesn’t enjoy dreaming! The venue – the Balmain Watch House – is a wonderful old building, built in 1854 as a police lock-up with two holding cells. Over a century later and after various tenants had been and gone, the building was in a terrible state and up for demolition. Thanks, however, to the dedicated work of the Balmain Association and the support of the National Trust it was preserved, restored, and remains standing to this day for all to visit and enjoy.